Some call them loopholes, tax breaks, or giveaways but the official name for them are tax expenditures. In August of last year, the Joint (House and Senate) Committee on Taxation detailed the many gimmes in the tax code. The Pew Research Center graphed out the largest expenditures including the big banana, tax free employer paid health insurance premiums. (They forgot to include the $38 billion in Sec. 125 cafeteria plans.) That program started during World War 2 when wage increases were frozen by law. That war ended 70 years ago but the “temporary” tax break goes on and on. The list of giveaways runs for 12 pages. Those with incomes above $100,000 get 80% of the mortgage interest deduction (page 37), 90% of real estate tax write-offs (page 38), 60% of the child care credits (page 39), and claim 86% of the charitable contributions (page 38). Reduced rates on dividends and capital gains cost almost $100 billion in 2014. 28 million low income families qualify for the earned income tax credit but the $68 billion cost for that is less than half the cost of tax free health insurance premiums. Almost 37 million families claim a child tax credit for $57 billion dollars (page 41). Seniors get $60 billion of gimmes in tax free Medicare benefits (page 32). In 2015, tax breaks for all types of medical spending will total almost 1/4 trillion dollars in foregone tax revenue. As spring arrives, let’s lobby for tax deductions for gardening expenses. Gardening is therapeutic, a genuine medical expense. 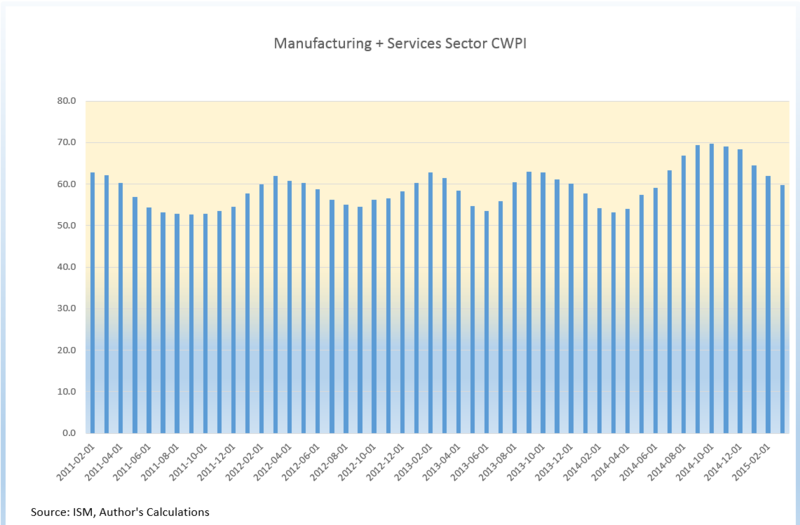 As expected, the composite Purchasing Managers Index (PMI) in the manufacturing and service sectors declined further but remains strong. We may see a slight decline for one more month before the cycle upwards starts again. 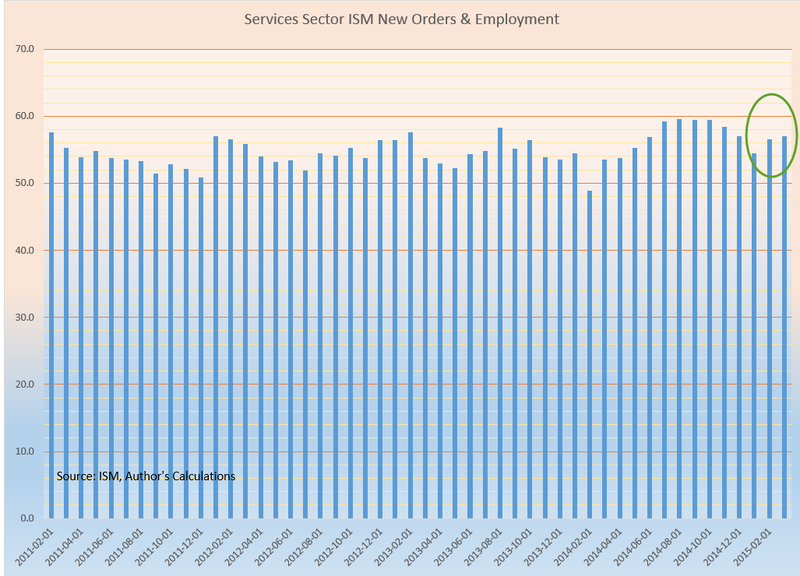 New orders and employment in the service sectors is strong and growing, offsetting some weakness in the manufacturing sector. March’s retail sales gain of almost 1% was a bit heartening after the winter slump. 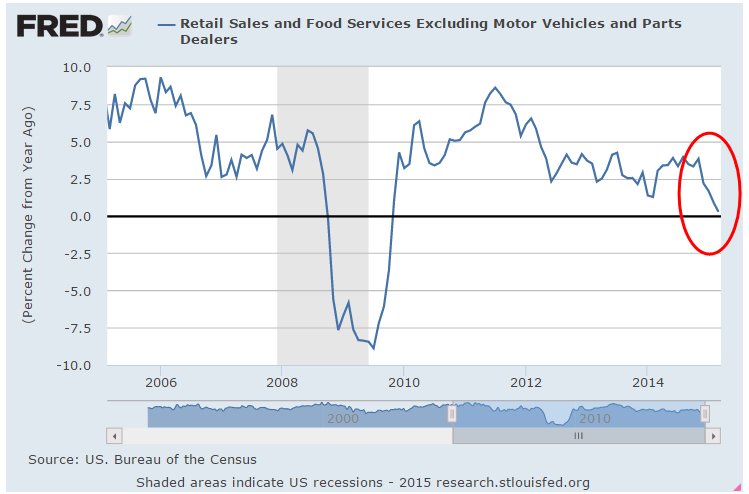 Excluding auto sales, year over year gains have dropped sharply since November and the trend continued in March as the yearly gain was only 1/4%. The Federal Reserve takes about a week after the release of the monthly labor report to compile their Labor Market Conditions Index (LMCI), a comprehensive snapshot of the many facets of the labor market. 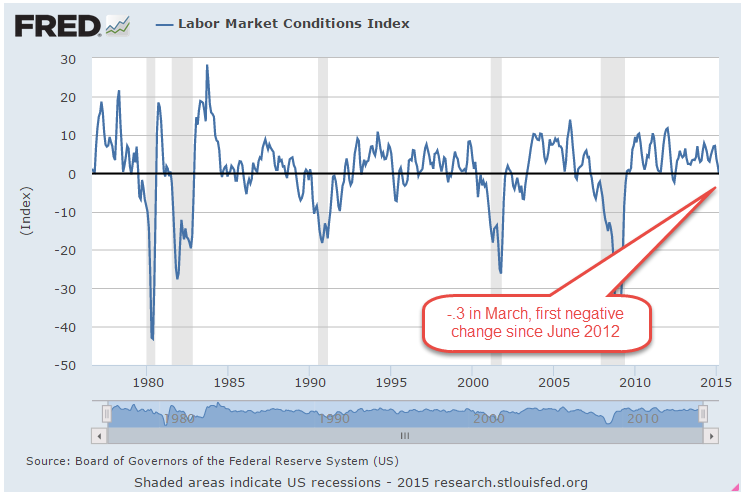 For the first time in three years, the index turned negative in March. It barely crossed below 0 but is sure to give some pause, a watch and wait when the FOMC meets at the end of this month. While some of the FOMC members have been making a more aggressive case for raising interest rates, chair Janet Yellen is sure to point out that the economy is below target in both employment and inflation. In an April 8th article, the Wall St. Journal reported that loans backed by bank deposits fell from 44% in 1980 to 20% in 2008. Since 2012, the big banks have fled the mortgage business and now account for only a third of new federally guaranteed mortgages. Small finance companies, which avoid much of the oversight and regulation in Dodd-Frank, now account for more than half of new mortgages.